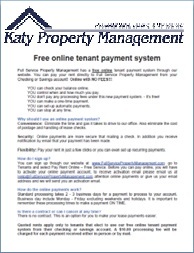 Katy Property Management has tenant payment system online. 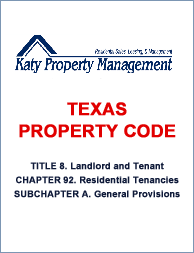 You can pay your rent directly to Katy Property Management from your checking or savings account online with NO FEES!!! 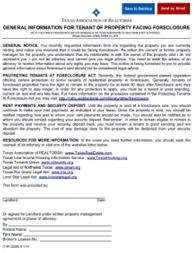 To ensure that you are not charged for any wear that already exists at the property when you move-in, it is very important that you provide our office with a detailed list of any discrepancies that you find. This list must be provided within 5-days of your move-in. Download and print this .PDF form to list discrepancies. Return a copy to our office within 7-days, and keep a copy for your records. 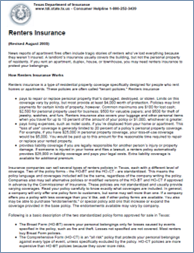 This document outlines the tenant(s) responsibilities regarding care and maintenance of the property. It is an addendum to the Lease Agreement. 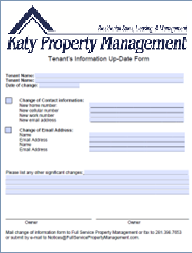 Help keep Katy Property Management update on any changes in Contact Information, Email Address, Phone Number and/or other changes. 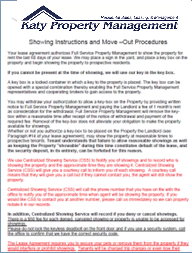 Planning on moving at the end of your lease? 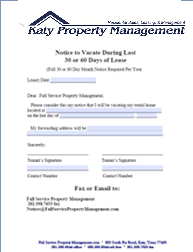 Your lease agreement requires that you submit a written notice that you are going to move. 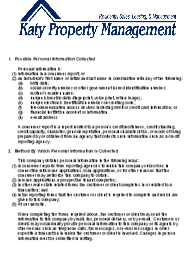 Katy Property Management Property works with Brenda Rummell, owner of Texas RIA, to help provide very competitive property and liability insurance for properties under our management. 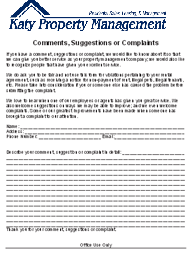 Comments, Suggestions or Complaints If you have a comment, suggestions or complaint, we would like to know about it so that we can give you better service as your property management company; we would also like to recognize people that have given you excellent service.